If one person suddenly seized the sole power to decide whether the U.S. government should shut down or stay open, according to his personal, partisan preference, Americans would be up in arms over the kidnapping of the democratic process, right? The democratic process was kidnapped by Republicans (and seven Democrats) in the U.S. House of Representatives on October 1. Just as the government shutdown began, House Republicans carried out a legislative coup against the usual House rules, taking the government hostage and choosing Rep. Eric Cantor of Virginia as their hostage-taker in chief. Republicans passed House Resolution 368, which, in a single opaque sentence, made Cantor judge, jury, and executioner for any possible reopening of the federal government. Yes, it really is pretty much that simple, and almost nobody noticed at the time. Yes, Democrats (all but seven) voted against it, but quietly, very quietly. The president paid it no public attention at all. And none of the capitol’s self-important “journalists,” whose job once-upon-a-time was reporting, said a mumbling word. The public, usually the last to know about anything except natural disasters, went on about its business in its normally sullen way, disgusted with government and not all that eager to know all that much about what pain our leaders would inflict upon us next. Only now, for reasons that are beyond mysterious, is the story getting much attention, though the attention – as in the Washington Post – is sometimes more about a viral video on the internet than the corruption and dysfunction in government the video illustrates. The standing House Rules (48 tightly-packed pages) include a rule about bringing some controversial bills to the floor for a vote. Traditionally, any member would be allowed to bring such a bill to a vote, free of any amendments. The Senate had passed a budget bill to extend unimpeded government operation past October 1. That bill, sometimes referred to as the “continuing resolution” was without amendment as it awaited the House vote. It was the “clean” budget bill. But Republicans wanted to dirty it up with amendments to undermine Obamacare and their other obsessions, so the last thing they wanted was a clean vote on a clean bill, a vote that any House member could call for, as of September 30. Conventional wisdom then was that the bill would pass. Sec. 2 of H. Res. 368 says, in its entirety: “Any motion pursuant to clause 4 of rule XXII relating to House Joint Resolution 59 may be offered only by the Majority Leader or his designee.” Clause 4 allows any House member to call for a clean vote. Resolution 59 provides for “continuing appropriations” for FY 2014 (there are six versions). 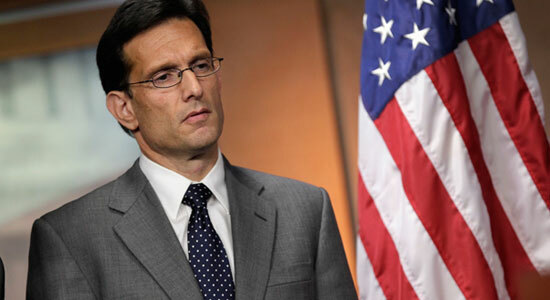 The Republicans’ Majority Leader is Eric Cantor. Translated, Sec. 2 means: Only Eric Cantor or someone he chooses has the power to call for a vote on a clean budget bill; the rest of the House members have been stripped of their traditional privilege in that respect. In other words, on October 1, whatever Republicans were saying about negotiating to keep the government from shutting down was bogus. What they were busy doing was passing legislation (228-199) that formally told Democrats they could pound sand. Also around October 1, there was much public speculation by House members and journalists that the continuing budget resolution from the Senate would actually pass the House, with some 20 Republican votes for it, if only House Speaker John Boehner, the Ohio Republican, would bring the bill to the floor for a vote. Boehner refused to do that, maybe because he thought, or wanted to think, that he couldn’t do it, at least not without saying “please” to Eric Cantor. And so, with a majority of both houses of Congress and the president all wanting to keep the government running, an apparent minority of the House shut the government down. And that was the plan all along. “Tonight we are once again considering a resolution designed to prevent a government shutdown,” said the committee chair, Republican Pete Sessions of Texas, in his opening statement, a statement demonstrably dishonest in that the resolution called for a conference committee with less than two hours before the shutdown was to begin. At first Louise Slaughter expressed surprise that the resolution called for a conference committee, when Republicans had been refusing a conference committee for months. She noted that the government was undoubtedly about to shut down and no one knew how long a conference committee process would take. And there it ended for awhile. Why wasn’t it worth a fuss then? Slaughter did not take her anger to the media or the public. None of the other Democrats took their anger to the media or the public. Apparently no one paid significant attention to C-SPAN. The government went ahead and closed and life went on, just as if the authoritarian boot had not actually come down hard on the House rule that might have spared the country the shutdown. And that’s the way America’s mediated reality remained until October 12 when House Democrat Chris Van Hollen of Maryland, in a patently artificial bit of political theatre, belatedly raised a complaint on the House floor. While he’s not part of the Democratic leadership in the House, Van Hollen is the ranking Democrat on the House Budget Committee and has been touted by some as “the next Democratic Speaker of the House,” after Nancy Pelosi. Staged almost two weeks after the Republicans’ draconian rule change, Van Hollen’s performance came complete with crude props including an oversize poster of House Rule XXII, Clause 4, large enough for easy reading on TV. Van Hollen’s ploy was to use the traditional rule to move that the House vote on the clean budget bill “and concur in the Senate amendment to open the government now.”As Van Hollen well knew, that motion could have been made any time since October 1, and would have been ruled out of order under the Republicans’ new rule allowing only Eric Cantor to make such a motion. On October 12, the acting House Speaker, Republican Jason Chaffetz of Utah, predictably shut Van Hollen down, but not before he’d spoken long enough to create a five-minute YouTube video walking the viewer through the facts of the Republicans’ legislative coup. “Democracy has been suspended,” Van Hollen says at the end of the clip that had 2.2 million views in its first four days online. Van Hollen posted his clip under the disingenuous title, “The GOP’s little rule change they hoped you wouldn’t notice.” Somehow, it’s not all that encouraging to learn that Democrats respond to a fascist pre-emption first by ignoring it, then by turning it into a sideshow, everyone rearranging deck chairs on the Titanic.